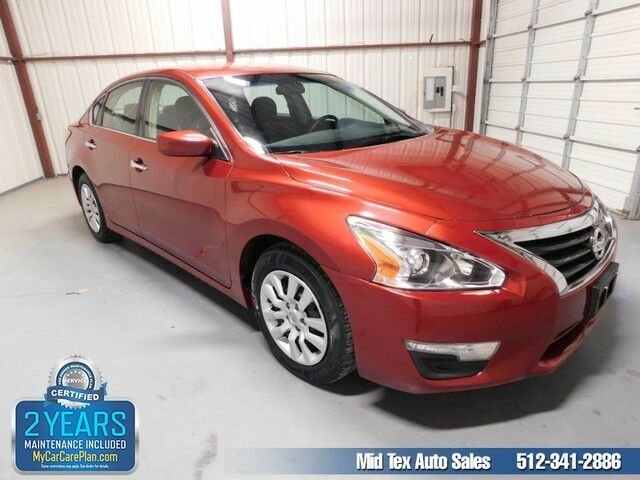 Mid Tex Auto Sales has a wide selection of exceptional pre-owned vehicles to choose from, including this 2013 Nissan Altima. Drive home in your new pre-owned vehicle with the knowledge you're fully backed by the CARFAX Buyback Guarantee. Stylish and fuel efficient. It's the perfect vehicle for keeping your fuel costs down and your driving enjoying up. You've found the one you've been looking for. Your dream car. More information about the 2013 Nissan Altima: The 2013 Nissan Altima offers plenty of choices for buyers looking for a smart, affordable midsize sedan. With a focus on building premium attributes into every facet of the new Altima--inside, outside and under the hood--buyers will find a car that punches above its weight in this hotly contested segment. This model sets itself apart with excellent fuel economy from 2.5L, available amenities to suit every taste, two great engine choices, Handsome, flowing lines, and standard continuously variable transmission Visit Mid Tex Auto Sales online at www.midtexautosales.com to see more pictures of this vehicle or call us at 512-341-2886 today to schedule your test drive.